My recent title is available on Kindle for download. This book covers basic models and methodologies that are revolved around User Experience (UX). The discussed topics include User Experience, Information Architecture, User Interface, Usability models, User Centered Design (UCD), User Centered Software Design (UCSD), different Software Lifecycles (SDLC) and how usability models fit into SDLC models. o What is a “Mental Model” exactly? • Software Development Life Cycle (SDLC): Where and How User Experience Models fit in? o How Usability Design Process Fits in Different Phases of SDLC? o How UX Fits in Different Models of SDLC? • Lean UX: Another Agile UX? Few years back I was using FlashAmp tool to create amplitude based lip sync for Flash characters to use in mini games and e-learning projects. basically it was a tool that allows to get the array of amplitude value from the mp3 voice over files and then using this array I could sync the movieclip containing lip of the character to the mp3 voice being played. But this was never dynamic…that means if you change the mp3 file, you need to pre-process the audio file and update the array again. Now things have changed. With LipSyncAS3, similar effects can be achieved, but there is no more pre-processing required. LipSyncAS3 is an easy to use development kit to integrate audio amplitude based runtime lip sync to your Flash characters/animations. The LipSyncAS3 does not require you to preprocess your audio MP3 files by any tool, rather it is based on amplitude based lip-sync generated in real-time. The LipSyncAS3 does not even require any server to render lips , so any animation/interactive solution using this can be delivered via CD/DVD for playing locally on a PC, and therefore is a good tool to be used in e-learning and CBT/WBTs. Note that, as the lip sync is not based on visme or phoneme set , the lip sync is not accurate to details. However it is good enough to be added to small interactive projects, web animation, e-learning projects like SCORM/CBT/WBT where interactive lip sync is required for voice mp3. The lip sync engine gives the designer/animators the freedom to design their own lip images with different positions in reference to the provided template, which is rendered in their Flash movies via without need to pre-process the voice audio in any manner. Many projects like the talking animals/birds at www.mgreetings.com use this LipSyncAS3 to do the lipsync parts. First step is to get the kit (Trial version) from http://patterngraphic.com/detailspage.php?product=PG001. 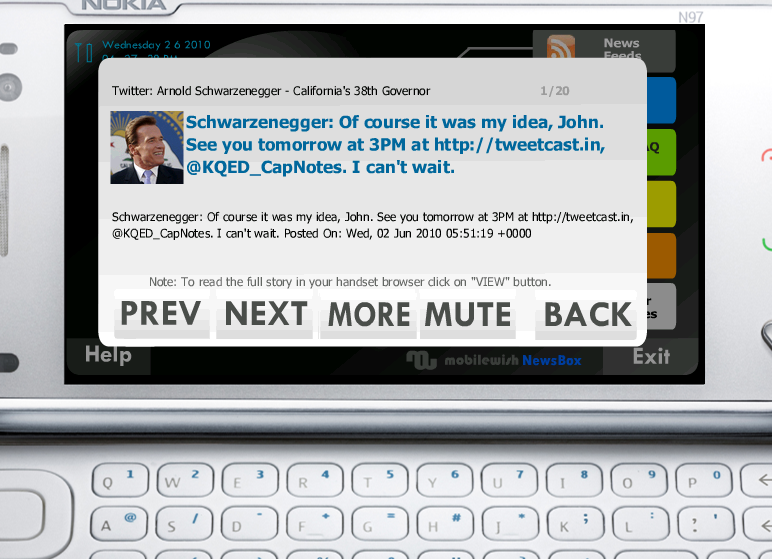 This is a full working version with a trial version message appearing. LipSyncAS3 is a purely Flash AS3 based solution. It requires your Flash movies to be published for at least Adobe Flash Player 9 or above. The Flash Movies must be compiled with ActionScript 3. To use the LipSyncAS3 kit you need Adobe Flash CS3 or above IDE to integrate to your Flash movies. You can also integrate your lip sync movies to Flex/Flash Builder applications. The audio files to be used as voice must be MP3 files as Flash only supports MP3 files to be loaded dynamically. Lip Engine.swf : This is the lip engine that has to be loaded into your movie. This engine does not have any visual parts visible in the stage. Rather it helps to run any lip pattern or the lip graphic you have designed to render in real-time. LipPattern.swf: This is the graphic representation of the lip to suit your animated character, that is rendered on the screen. You can create your own custom lip set based on a template FLA provided. The lip pattern can have maximum of 10 lip positions as shown below where the lip position image set at the frame 1 of the timeline will refer to a lip in silent position. From frame 2 on ward the lip image must show the opened positions based on the amplitude ..like the frame 3 will have the lip more opened than the one in frame 2. similarly in frame 10 the lip will have the lip image with widest/longest open lip position. Note that depending on the mp3 audio quality, voice type, you may need to fine tune your lip design to match the needs. This method is called at the beginning, to initiate the lip engine. This method does the following: •	It validates provided serial number •	Loads Lip engine •	loads your custom lip pattern. lipLicenseEmail:String is your registered email id while purchasing a license of this product. lipLicenseSerial:String is your purchased license/serial number. In case you want to try the product use “TRIAL” (case sensitive) as your lipLicenseSerial and in case of registered email id use any of your email id. Running a trial version will not affect any of the functionality. It will only add a message to your flash movie mentioning that this is a trail version. Note trial version is only for the purpose of reviewing product. This method sets the mp3 file path which contains the voice for lip sync. onVoiceLoadComplete:Function is a function where you define what to happen when MP3 load is complete. onVoicePlayComplete:Function is a function where you define what to happen when voice playing is complete. onID3Load:Function is a function where you define what to happen when voice ID3 details are loaded from the mp3 file. For example you can then call the GetID3Info():ID3Info to get the ID3 details like artist name, album name, year and so on. onIOError:Function is a function where you define what to happen when mp3 file could not be loaded. onVoiceLoadProgress:Function is a function where you define what to happen while loading of mp3 continues. For example you can check for total loaded bytes to show a loading progress. PlayLip():void This methods start playing already loaded mp3 and along with it starts rendering the lip. If the mp3 was paused using PauseLip(), then it resumes the playback from the last paused position. This methods stops the playback of mp3 and stops the lip movement. This methods start playing already loaded mp3 from the beginning. The default buffer time for the sound object to load mp3 is set to 1000 miliseconds. You can change this by using this method. This moves the play head to a particular position (in miliseconds) in mp3 to play. This can be useful in creating progress bar for the playback to control where to start playing . This returns the total bytes (file size) for the mp3 being loaded. This sets the volume of the target voice object for any particular mp3. Each time a new mp3 is loaded the volume sets to default value., and in that case you can set the volume to your desired level using this method. This sets the pan value for the target voice object. This returns the volume value. This returns the pan value. The sample zip archive contains one sample template FLA file with example usage of most of the available public methods. In addition a sample Pocast Reader application FLA file is also included in the archive, in which a character’s lipsync is rendered as per the pocast voice. Also there are 2 sample lip pattern FLA files, which you can use to create your own lips. http://www.patterngraphic.com/samplefilesdownload.php?product=PG001 to download the zip archive with the sample files. (c)2009, www.PatternGraphic.com, All rights reserved. This template provides most of the available public methods of the LipSyncAS3 engine. You can use this sample template to create your own lip sync enabled movies. You need to publish your movie for Action Script 3 and aFlash Player 9 or above. var lipLicenseSerial:String = "TRIAL"; //Use your purchased license serial number here. //the method is to trigger something when lip pattern is finished loaded. helpful when lip pattern is a big file. Everyone knows that developing a PureMVC application in AS3 requires a good amount of effort in the begining weeks. Same was my experience in some of my applications I had developed in past for different clients, who wanted the perfect pureMVC structure to be implemented and that too with in limited budget and time. It was a pian for the team to deliver the project in PureMVC if the budget is crushed. So I was working on a small tool kit that actually helps reduce the efforts for the team in the beginning stage of the project that implement that use the PureMVC framework for AS3. Actually any project implementing pureMVC in AS3 in Flash , approxmiately 15% – 30% of total development effort is spent in writing the UI level Views, Notifications, Commands, Mediators and Proxies . In the begining weeks the initial effort is spent in preparing the basic work flow based on the business flow defined in the requirement docs. Once the basic flow is ready , the rest of the effort goes to implementing the business logic to the base framework prepared. Another point is very intresting to note — the more you split your application into smaller loosely coupled modules/logical units, the more flexible your application becomes, but at the same time it requires adding more .AS files representing more splitted code lines of logical units, commands, notifications and views etc. But client is never happy with the flexibility implemented, nor with the requests to add more to budget for more lines of codes …rather wants the application to be unendingly flexible as well as modular without allowing any additional effort hours. And a typical out put can look something like this as in the following image in the first weeks of development with the basic flow ready. Now how if this can be done with in a day or two instead of spending one or two weeks? 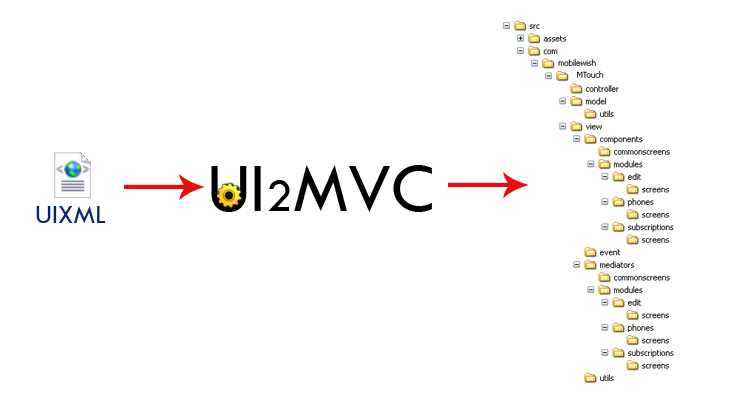 Well that’s what UI2MVC is all about. Currently it takes UI level inputs, lable names, file names in the form of a specific formatted XML (I call it UIXML) and out puts the basic flow of pureMVC ready application that can be compiled without any graphical views. Though the tool is in very primitive stage, I have successfully used to deliver two projects where roughly 2-3 weeks of time is saved in each project. I am now trying to create a GUI version of it so that it will be more userfriendly and can fasten the workflow. Also currently this is meant for certain types of applications development with AS3 PureMVC, such as it is limited to single common navigation controller. Note: this also currently does not support Flex/Flash Builder projects. Great News! My Travel application Pocket Travel Assistant has been shortlisted (in Grand Jury held in Colombo during June 10-13, 2010.) as a finalist in MBillionth Congress & Awards Gala to be held at New Delhi on 23rd july 2010.The projects have found place among 160 “Successful Quality Nominations” received from countries like India, Pakistan, Sri Lanka, Bangladesh, Nepal, and Maldives. MBillionth Awards South Asia Mobile Congress is organised by Digital Empowerment Foundation, , WSA MobileContent, Department of Information Technology , Govt of India with partners like Nokia Siemens Network, MobileMonday etc. There wetre other categories also like m-Environment, m-News & Journalism, m-Inclusion, m-Health, m-Education & Learning, m-Entertainment, m-Governance, m-Culture & Heritage, m-Business & Commerce/Banking. An exciting lineup of speakers from the mobile industries, as well as other industries and sectors will be touched by the mobile market, including entertainment and education. Conference will be held in multiple parallel thematic sessions in all 10 categories with panel of speakers, presenters and participants will be from mobile world of application, service delivery and content. The recommendations from the sessions would be used to analyze the growth of mobile application in the respective category. The m-Billionth Award South Asia 2010 is first of its kind in the region recognising and felicitating mobile innovations, applications and content services delivery. It is to honour excellence in mobile communications across South Asia spread over 9 core categories. The m-Billionth Award is designed as an annual South Asia’s leading mobile content’s award platform towards larger regional Mobile Congress in media and policy advocacy. 21st Century World could be a cellular age going by the phenomenal increase in cell phones worldwide. The cellular age is fast accelerating with cell phones magnifying our larger identity in both individual and collective domains and in various social, cultural, economic contexts. This tremendous growth of mobile penetrations is a scene to be witnessed worldwide especially in developing countries with larger population concentration. Thus, the power of cellular technology is evident. And South Asia is and cannot be left behind. The amazing picture is this. India has reached 600 million mobile penetrations. Other countries like Bangladesh and Sri Lanka in South Asia also showing great results as mobile users. The population percentage coverage of mobiles in the region is such – India with 46.37, Bangladesh with 31.11 , Sri Lanka 51 and Pakistan 59 and the trend is moving upward each day. South Asia is bearing witness to the power of the mobile device to empower millions with information, content and services. The power of mobile in meeting knowledge, social and economic deficits is a challenge in these countries. On the contrary, the power of mobile innovations and applications in content and services delivery is amazing and exponentially on the rise. It is time that we in South Asia, the nations and governments in the region, as well as service providers, give a thrust on mobile for delivering meaningful services, especially that could empower and enable efficient day-to-day life for the larger masses. It is imperative now that a situation be created where we have the best of applications, contents, and services accumulated as examples to drive the government and industry to ensure they create meaningful opportunities in last mile mobile content and services. Governance and development is bound to be better with this. Towards this objective, in order to make the content and services deliverable through mobile as a medium and means, Digital Empowerment Foundation has launched the m-Billionth Award SOUTH ASIA – ON MOBILE CONTENT & APPLICATIONS FOR MASSES. 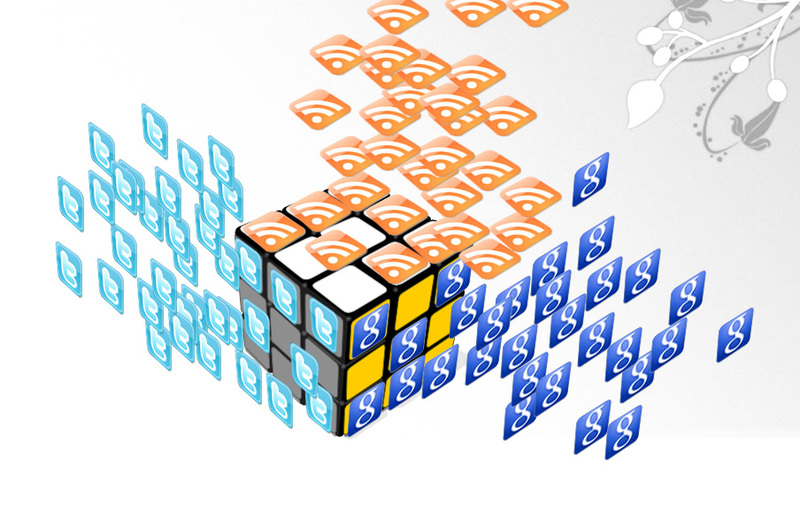 MobileWish NewsBox is one m-News application developed in FlashLite 3.1 with a 3D Navigation for touch enabled handsets like Nokia N97 that reads out the various news feeds, Twitter updates, NASDAQ stock updates and blog posts . The idea behind MobileWish NewsBox was to develop a Talking news app with a very user-friendly and easy-to-use touch enabled 3D navigation system which will be easy to personalize. Send Talking Dogs and Singing Cats to your friend’s mobile: mgreetings.com is Live! Yes, www.mgreetings.com -one of the very cool Flash (rather Flex AS3) based greetings website is live now! Yvo and the team struggled hard for the project and it took 18 months to get from idea to go live. This is the only site in the world that is Next to AmericanGreetings and Hallmark (both billion dollar companies), who can deliver Mobile video greeting cards. And the best part of the news is that mgreetings.comis the only company that can deliver Talking cards to a mobile phone! The site showcases several options to choose from different characters who speak or sing aloud the texts you write. And once personalised you can send them to your friend’s mobile device. 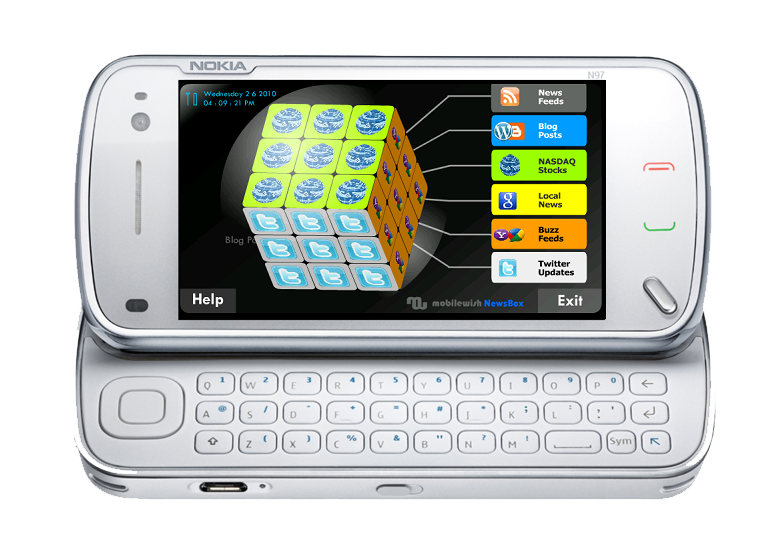 Most of the popular handset brands, OS are supported by the generated card including iphone, symbian, windows. As long as your friend’s mobile supports video he can enjoy the card you sent to him. There are many FREE cards which you can send using a FREE 1 months trial period. The team has lots of new ideas and features in the road map. So don’t forget to give feedback at the site. Note. I have limited promotional codes with me which you can use to get 20 PREMIUM cards free. If you need one, send me an email asap so that you can get it before anyone else gets it.